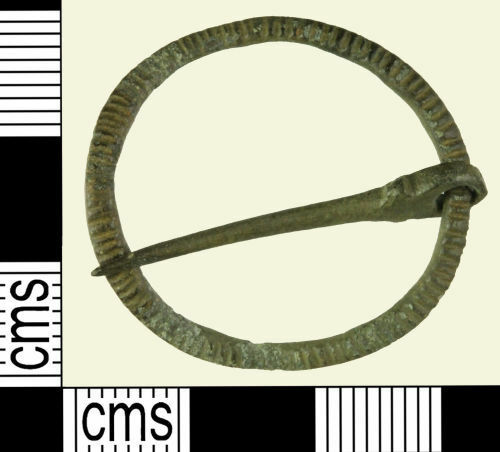 An incomplete copper alloy medieval annular brooch dating to the period c. AD 1250 - 1450. The brooch comprises an ovular frame with bevelled edges and incised with a series of grooves around the entirety of the obverse of the frame. The reverse is undecorated. The pin features an integrally cast perforation, the ends of which have been overlapped to close around the frame. It features a small knop on either side of the loop and then tapers to a point. The brooch measures 28.21mm in diameter (internal diameter 24.14mm), is 1.74mm thick and weighs 2.31g.